Hot humid summers can really take their toll on landscape shrubbery. Improper pruning is hard on them too, and many people either don’t prune enough or prune too much or at the wrong time. Some shrubbery is difficult to contain in smaller spaces. 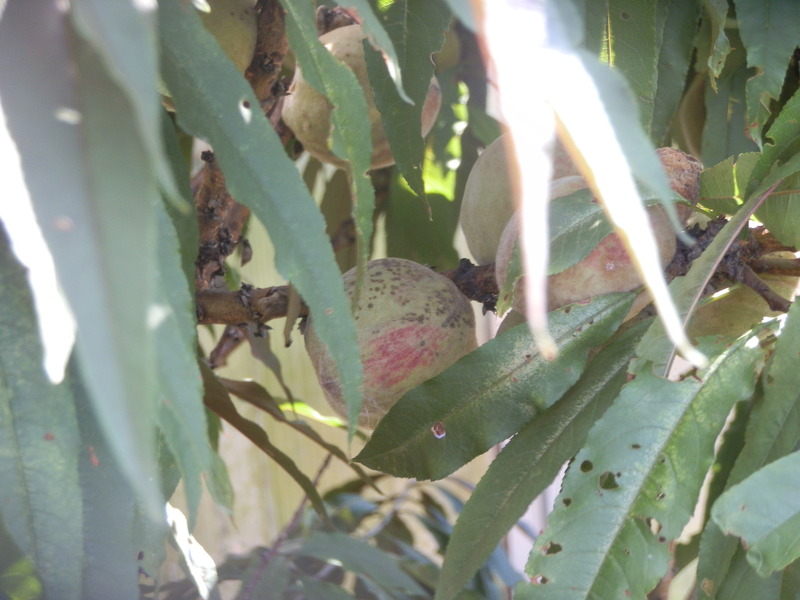 Fruit trees create even more maintenance nightmares. I have two dwarf ornamental peach trees that are thriving in the summer heat. Their canopy is so lush and dense they must be inspected closely to notice they are loaded with fruit. Unlike my other fruit trees, they show virtually no signs of disease and they require little pruning. My plants are seedlings, but the cultivar they most closely resemble is Bonfire. Foliage is deep purple. Fruit quality is not very good if you like fresh peaches, but they make great peach butter and peach bread. They also make pretty good pies. You’ll have to wait a little longer than most peach varieties. These little guys don’t soften up until September. These peaches have strong peachy taste and a rich reddish color when cooked. Flesh is rather mealy, almost the consistency of mashed potatoes. Other culinary negatives are that they are small and not freestone. Their greatest value is not for their fruit, though wildlife might disagree. Dwarf patio peaches provide contrasting color and texture to a landscape. Long slender dark red to purple leaves on compact plants is eye-catching. Plants also have a slightly weeping growth habit. Autumn foliage is orange and the dark speckled bark is attractive in winter. In spring, deep pink double flowers can be spectacular, and plants are self-fruitful. These miniature trees rarely grow taller than six feet and they thrive in containers or in the ground provided soils are well drained. Planting them in containers will make them grow a little smaller. They’re also a good choice for container use because they have no thorns. Regardless of the garden type they should be planted in areas with adequate sun, although they do tolerate substantial shade. High heat and humidity are usually not a problem. Bonfire peaches also tolerate drought well. Most pruning should be performed when plants are dormant. Remember that peaches fruit on the previous season’s wood, so don’t remove more than half of that. Plants will be healthier if some branches are thinned. This promotes vigorous growth for the remaining ones. Also, since fruit set can be heavy it is important to notice the angle of the branches in relation to the trunk. Wide angled branches are stronger. This is an important consideration for any tree that produces appreciable fruit. Other varieties of patio peaches exist and many have better fresh eating qualities than the Bonfire type. Bonfire has by far the prettiest foliage in my opinion. Bonfire also is smaller and easier to train into a desirable shape. Prioritize what’s important to you. If you want fresh fruit and aren’t as concerned about shape and foliage then Reliance, Bonanza II, Southern Flame, Southern Rose, and Garden Gold have great fresh eating qualities. 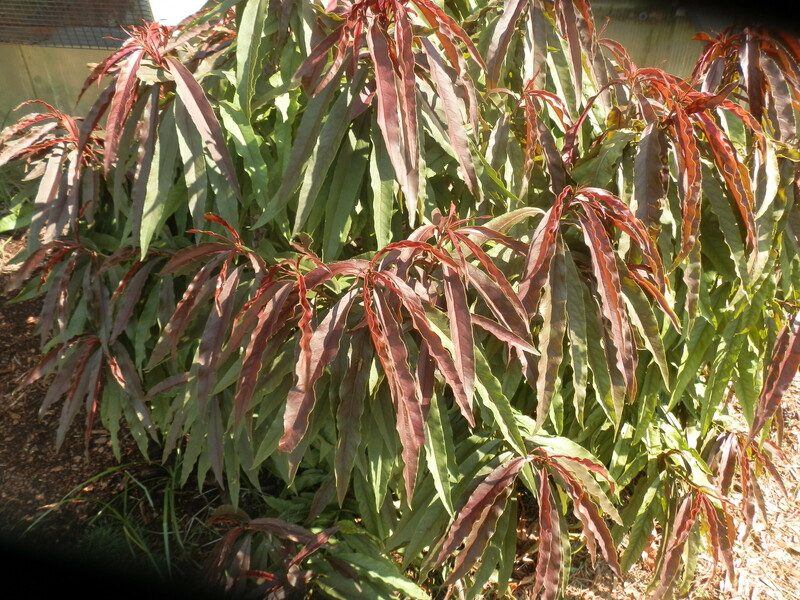 This entry was posted in foraging and tagged attractive bark, bonfire, burgundy foliage, deep purple foliage, dwarf trees, edible fruits, orange autumn foliage, patio peaches, peach, peaches, weeping growth habit, well drained soil, wide angled branches. Bookmark the permalink.